Cisco Application Centric Infrastructure (ACI) is a brand new way of networking that allows network engineers and architects to not only implement network virtualization within their data center, but also manage their physical network from the same management console. For more information please see my previous article here or check out the Cisco documentation here. In this article I’m going to use the Application Policy Infrastructure Controller, or APIC, to create an ACI Fabric and start using ACI. The APIC is essentially the brain of the ACI solution. Most, if not all, of your configuration will be done through the APIC either via the GUI or some other sort of orchestration tool accessing the APIC. The APIC is available now and while it’s a software solution, currently it is shipping on a hardened Cisco UCS C220 M3 server. 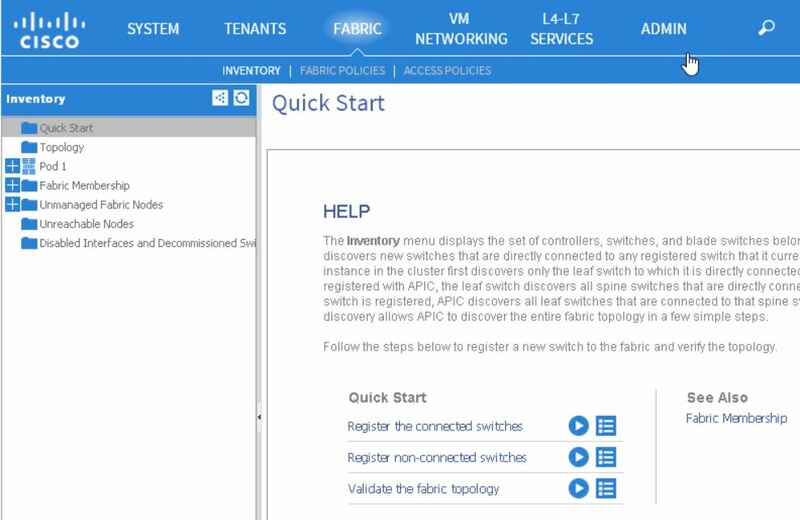 Every fabric should have at least three APICs in any production environment to provide for redundancy, though you could get away with one APIC in a testing environment. To get started with Fabric Discovery, which literally means finding the leaf and spine nodes we need to start with connecting an APIC to a leaf node. We can do this manually or programmatically using the APIs. Let’s go through the manual process here. First we’ll need to login to the APIC by opening a browser and going to the APIC. We’ll then click on the Fabric menu at the top as shown in the figure below.